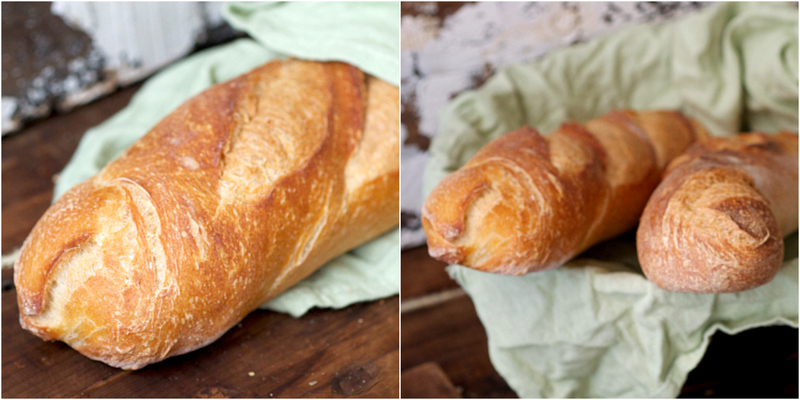 There are few things better in this world than a homemade fluffy French baguette. 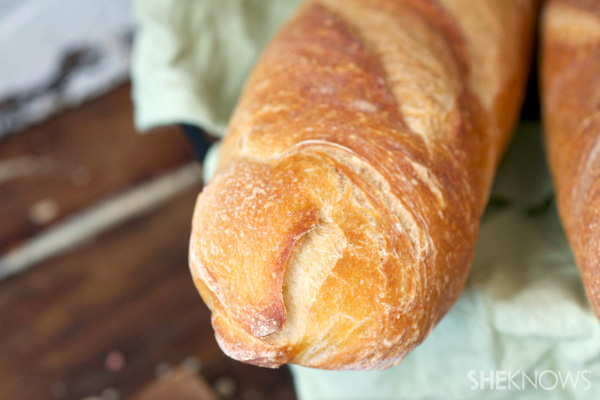 If you’ve never made this classic French bread, then you’re really missing out in life. I know, bold statement. But one crispy bite and you’ll know. The edges are perfectly crispy, the insides gooey and soft and each bite has that signature crunch you’d expect from the breads you find in bakeries. The key to the artisan look and taste is a pizza stone, so if you don’t have one, get one! Mix the water and yeast together in the bowl of a stand mixer. Let sit at room temperature until the yeast foams up. Attach the bread hook to your stand mixer. Add the flour, 1/2 cup at a time, on low speed, making sure it’s incorporated after each addition. Knead in the mixer until the dough is smooth and doesn’t stick to the sides of the bowl. You want it to look smooth and shiny. Place the dough on a floured surface and let rest for about 10 minutes. Then, with floured hands, knead the dough until it forms a soft, shiny ball. Place the dough ball into an oiled bowl and roll it to coat the entire ball in oil. Cover with oiled plastic wrap and let rise for at least 2 hours. Once risen, punch down slightly and let rest for about 15 minutes. Once the dough has rested, carefully split into 2 rectangles. Fold the bottom half to the center of the rectangle and seal the seam. Fold the top half to the center and, once again, to seal the seam. After that, roll the top half of the dough over the seam to create a new seam on the bottom of the loaf. 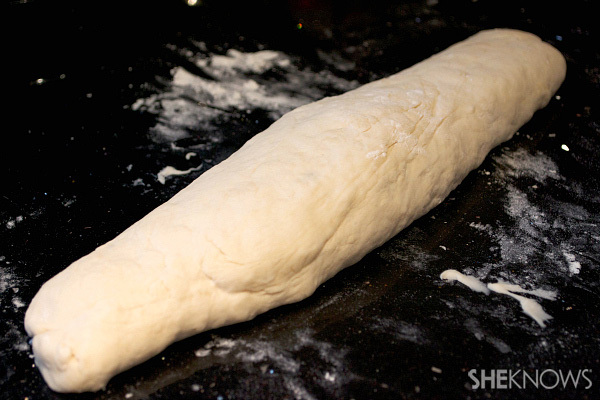 With your seam side down, carefully roll the dough back and forth to form a long baguette. Place the baguettes on a baking sheet lined with cornmeal. Top with greased plastic wrap and place in a warm place to rise another 1 to 1-1/2 hours, or until doubled in size. Once the dough has risen, score the bread on a vertical slant. We did about 5-7 scores on the bread. 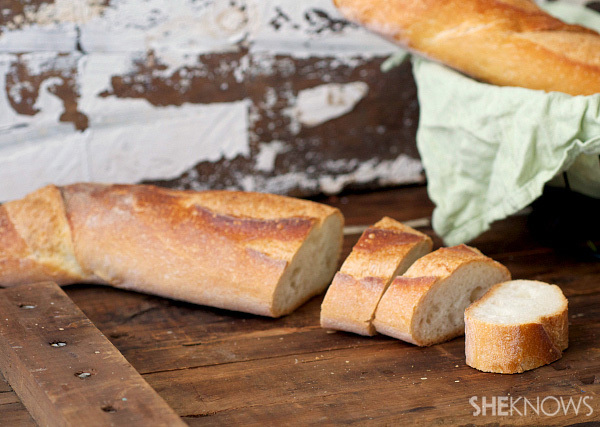 This will pop open and create that iconic look of French bread. Preheat oven to 450 degrees F. Brush the baguettes with egg whites and bake for about 20-25 minutes, or until golden brown.